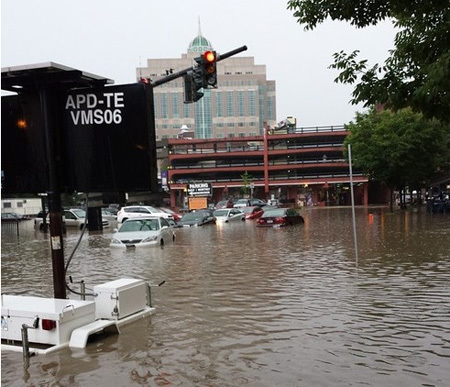 Tuesday, August 5, the City of Albany learned in a most spectacular and disastrous manner what happens when our civic leaders neglect the drainage system under our feet. The Beaverkill River, buried under the streets, pointedly ignored by successive City governments, forced to carry raw sewage and confined to pipes that have been allowed to disintegrate and cave in, rose up from the Earth like a monstrous avenging angel and for a few hours taught the City the consequences of infrastructure neglect. But immediately after the disaster it became clear that the lesson was wasted. 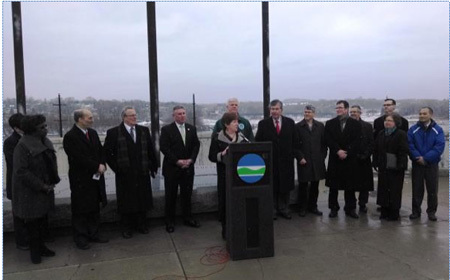 Mayor Kathy Sheehan, who certainly knows better, all but declared that this was a once in a lifetime event, and City officials echoed her refusal to acknowledge the cause of this flood. And the people of Albany, misinformed by our elected officials and by the corporate media, appear to be continuing to accept this unacceptable and dangerous situation that caused the flood. But massive flooding will happen again and again along the Beaverkill storm drain line, and no amount of denial will make the problem go away. 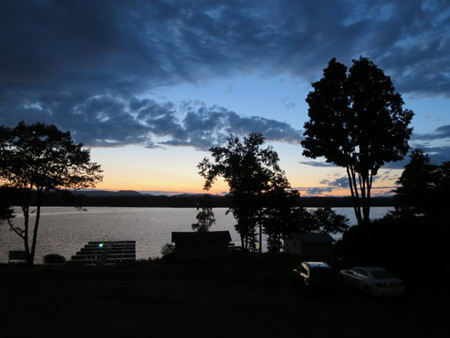 So there I was Tuesday evening around 8:30 PM at the cabin overlooking Great Lake Sacandaga, happily sitting down to a late meal when the phone call came in. Our friend Eddie, who was watching our house back in Albany and feeding the cats informed us that the City had just been hit with a flooding disaster caused by a heavy thunderstorm. And it seems that the disaster had impacted our house in the South End, like, three different ways. Eddie has this manner of compacting relevant information into concise reports, particularly during crises and emergencies. (The “we” refers to herself and her daughter, who is often mistaken for her sister.) Fortunately none of the downed wires along Catherinewere power lines, just phone and cable. She then phoned again about five minutes after that first call to tell us that our cellar was flooded from one end to the other. Questioning her closely as she splashed through the cellar water, I was able to determine that the overloaded City sewer system had backed up rainwater into our house. Again. Therein lies the story. Since there was nothing I could do that Tuesday night I grumbled a lot, swallowed supper and went to bed, not sleeping well with an upset stomach. The next morning I skipped breakfast and drove into Albany, arriving at about nine. Considering what Albany went through the night before, there didn’t seem to be a whole lot of visible damage. Around my neighborhood I could see some washed out dirt and gravel in a few spots and some fallen tree branches, the same aftermath as any severe summer thunderstorm. It was like nothing unusual had happened. One certainly would have that impression from the embarrassingly lame corporate media reports of the flood which were (predictably) mostly concerned with how suburban commuters were inconvenienced by the flooding, punctuated with the usual anti-Albany slant. The night before the TV and online newspapers were flashing images of drowning cars and declaring Albany a complete loss, but by Wednesday morning they were back to celebrities and Ebola panic like hardly anything locally disastrous had happened. But fortunately All Over Albany (AOA) published photos sent to them by their readers, so we have a permanent record of the enormity of this short flood. What that photographic record shows, clear to anyone who has followed the history, is that we can’t fault the occasional heavy storms or blame the problem on Global Warming. 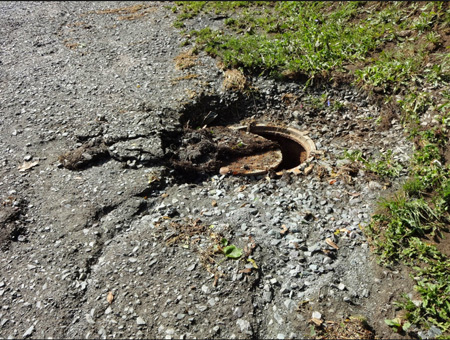 The problem is that the storm drains and sewers of the City of Albany have been denied repair and upgrading by our City government for so long that today they can no longer reliably perform the function for which they were built. The most serious and widespread flooding was caused by the spectacular failure of the storm drain line that concerns me the most, The Beaverkill. This major line, which is supposed to be strictly a street drain, runs through my neighborhood and often stinks of raw sewage. I’ve written about The Beaverkill before, let me remind you of the route that it runs through the City, and show you how it caused the greatest damage to our City. The Beaverkill is actually a river that was buried in the 1800s. Approaching downtown Albany from the west, it runs through a big pipe underneath Elberon Place, although many years ago when I was working on a couple of houses along Elberon, I observed that if you dug about 18 inches into the cellar floors of the houses there was watery mud. In other words, during normal times The Beaverkill under Elberon is not confined to the pipe. 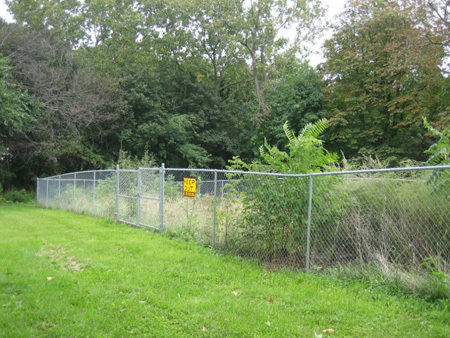 This Park South neighborhood is the source of sewage that has been increasingly directed into the Beaverkill by the massive redevelopment oriented around Albany Med. Although the redevelopment project has been greatly increasing the population density of the neighborhood with offices and apartments, there has been no effective work done to increase the capacity of the pipes carrying away wastewater from these new buildings and from the ever-expanding hospital. And it goes without saying that no new sewer lines have been built for these new sewer users. Instead what we have is a greater reliance on the existing sewer lines running through the neighborhood, which weren’t able to handle the demand before the redevelopment. But now there’s a whole lot of new toilets flushing poop and piss into these inadequate Park South sewers, and all that human waste has to go somewhere. A combined sewer is a type of sewer system that collects sanitary sewage and stormwater runoff in a single pipe system. Combined sewers can cause serious water pollution problems due to combined sewer overflows, which are caused by large variations in flow between dry and wet weather. This type of sewer design is no longer used in building new communities, but many older cities continue to operate combined sewers. There has been no serious attempt to increase sewer capacity to handle Park South because up until now the Beaverkill storm drain has done a fine job of carrying raw sewage downtown through the South End and directly into the Hudson River. So the storm drains and manholes in the South End stink and raw sewage endangers the South End riverfront and ends up flavoring the drinking water for the Town of Bethlehem downriver. Who cares? Well, now we see why everyone in Albany should care. Not only are the sewers inadequate, but the Beaverkill storm drain can no longer handle big thunderstorms. However, judging by the official statements by public officials in the aftermath of the flood, our civic leaders continue to have no intention of doing a damn thing about this fixable problem. As for the rest of the Beaverkill storm drain line, I’m told by eyewitnesses that the tremendous water popped manhole covers all the way downtown from Delaware Avenue to the Hudson River. 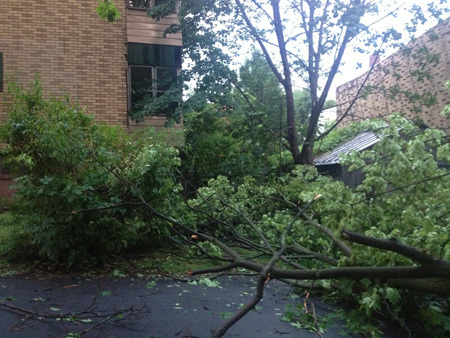 It also poured out of the aeration grate in Lincoln Park and soaked the community garden along MLK Boulevard. I saw Lincoln Park Pool on Wednesday morning, the water was dirty brown. A fellow I know told me that he watched a geyser shooting some 20 feet into the air out of the manhole on South Pearl Street near Morton Avenue, as high as the building next to it. I sure wish that guy had a camera on him, too bad. Also on Wednesday morning I saw that Warren Street by the newly opened Capital South Community College was covered with dirt and gravel right over the sidewalks, but I’m told by Darren Scott of Albany Housing Authority that other than a few leaky windows the college building came through the storm fine. But that one bright spot along the Beaverkill was the exception. Beyond South Pearl Street it was a total flood disaster. 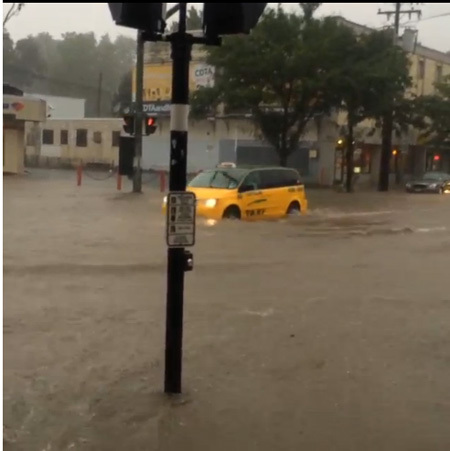 Water simply poured out of the manholes and turned downtown into a lake. For a few hours downtown Albany was flooded deeper inland than the great 1913 flood, which generated a typhus epidemic that killed some 200 people, mostly children in the South End. How is it that no one was killed or seriously injured by this unnecessary flood caused by some 70 years of infrastructure neglect is a mystery to me. It’s also a damned big piece of luck for the City government, which would have been morally and quite possibly legally responsible for any death or injury. All I can say is if The Wife had been drowned or battered by the flood then right now I’d be going after City Hall with a busload of lawyers and anything else I could think of. 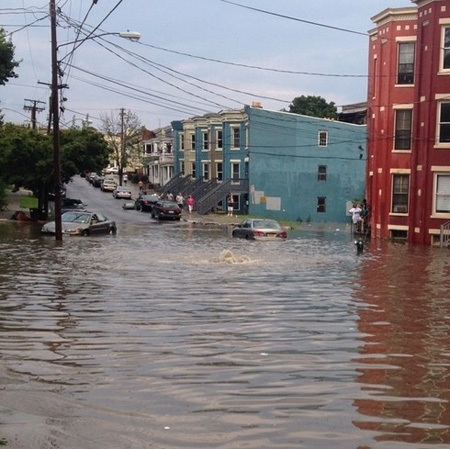 Although brief, the flood happened because of a long-standing problem that the last three mayors of Albany, Erastus Corning II, Thomas Whalen and in particular Jerry Jennings, made a special point of ignoring and allowing to grow worse. For example, in 1993 at the end of Whalen’s time in office, part of the Beaverkill line collapsed in Lincoln Park and there it still is today, lightly covered up and surrounded by a chain link fence. Now it is current mayor Kathy Sheehan’s problem, one that she can no longer ignore even though it looks like she wants to. A big part of the problem, one that does indeed often get mentioned by our elected officials and local media, is that the oldest sewers and storm drains are located in downtown Albany. These sewers were adequate when they were built back in the 1800s, and worked fine after they were upgraded in the early 20th Century. I don’t ever run across stories of the streets flooding uncontrollably during those times, although back then there was frequent severe flooding of the waterfront from the Hudson, another story altogether. But in the middle of the 20th Century after World War 2, our civic leaders found it profitable to expand the City westward. Land developers were encouraged to construct owner occupied houses surrounded by yards, building mostly on easily excavated Pine Bush sand. While the earliest new neighborhoods were relatively compact, as time went on westward development degenerated into sprawl, wasting space to provide amenities for automobiles. All of this westward expansion approximately doubled the inhabited area of the City, and a network of sewer lines and storm drains were built to accommodate these new houses and auto amenities. 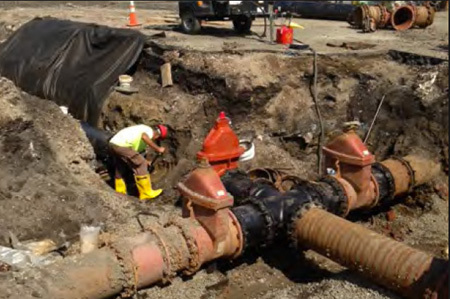 These newer uptown wastewater pipes, which are wider than the older pipes downtown, were simply attached to the narrower pipes which were expected to carry the bigger load. As far as I know, no new drain lines have ever been constructed through downtown Albany to help handle the runoff from westward sprawl. It is a wonder to me that the wastewater system works most of the time. The last three mayors had no intention of spending money and political capital to update the sewers and drains so that they could handle the flow. One gets the distinct impression that none of the three gave a damn about the problem and figured somebody else in the future would get stuck dealing with it. Thanks guys. I recall all too well back in 1995, a mere 19 years ago, there was another “100 Year Storm” just like this one. The Wife and I had bought a building on Morton Avenue around the corner from our house which I had just started renovating, and that particular 100 Year Storm flooded the apartments in the building and also came up in the basement of this and almost every house in the neighborhood (including my own.) 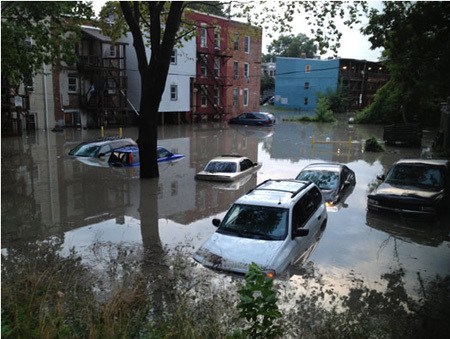 And let me remind everyone of hurricanes Irene and Andrew that arrived a week apart in late summer 2011, which delivered a double whammy that overflowed the banks of the Hudson but also came up the storm drains and sewers. Oh, bullcrap Joe. Your Water Department has been slowly replacing leaky water pipes and lead lines under the City streets for the past several decades. Little by little, one dig at a time, our water delivery infrastructure is being updated, where there is a will the political structure eventually gets the job done. 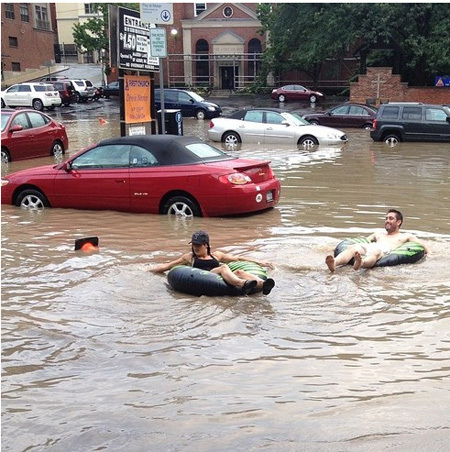 The City could have been doing the same thing with our sewer and storm system. But that hasn’t been happening. With the water lines we see that the City has a financial incentive to upgrade, the old lines leak too much and thus cause the City government to lose money. But when it comes to our sewers and storms there is nothing to push the politicians into action. Since the taxpaying voters do not understand the problem because they have quite deliberately been kept in the dark, there is no public pressure to get our officials moving on this issue. Well, shoulda woulda coulda. We now have a crisis on our hands. Those 97 percent of climate scientists, the ones not owned by fossil fuel corporations, are telling us that our region can expect winters with bigger snowstorms and wetter summers with more severe storms from now on. This means that the battered and inadequate Beaverkill drain line will back up again, and again, and again until it can no longer drain and the floodwaters can no longer recede. The main concern of these bigger government agencies is not the floods that are devastating Albany, but the human waste that the Beaverkill stormwater drain is discharging into the Hudson River. This was a big dirty secret that got zero official attention for many decades. That is, until about four or five years ago when I started publishing pictures of human poop floating out of the Big C Pipe next to the Island Creek fishing deck, and started loudly complaining about how that raw sewage was generated by Albany Med and the Park South neighborhood. Yeah, this blog has some positive effect, I’m proud of myself. So last year the State DEC leaned on the upper Hudson River communities to sign on to a Long-Term Control Plan (LTCP) which, according to DEC director Joe Martens, is intended “to take decisive action to prevent pollution from entering the Hudson River after storms.” The cost of this regional upgrading is $136 million, money which appears to be coming mostly from the local communities and financed with low interest State loans. From several public officials I’ve heard that the original cost of the LTCP was about $30 million lower because the plan neglected to deal with the biggest source of Hudson River pollution in the region, the Beaverkill storm drain line! It seems that the former administration of Jerry Jennings neglected to alert the authorities to the problem of the Beaverkill, although he did reluctantly agreed to include the pollution problems of Patroon Creek which, among other things, is dirtied by runoff from the Rapp Road “landfill” in the Pine Bush. So then the cost of doing something about The Beaverkill was tacked on to the original estimate, the other municipalities naturally balked. To them it seemed like an extra boondoggle, and they made no secret of their disdain for the City of Albany and our problems, why should they pay for us? So the State looked for the cheapest way to handle the Beaverkill sewage, which also happens to be a blatant anti-Albany action. So I’m hearing from those same public officials that the Capital District Planning Commission (CDPC,) which has put together the plans for the LTCP, has proposed something really ridiculous. They want to construct a sewage treatment plant on the waterfront where the Beaverkill dumps into the Hudson. Seriously. Apparently the CDPC wants to grab the parking lot of the U-Haul building for their treatment plant by eminent domain and do nothing about the flooding. 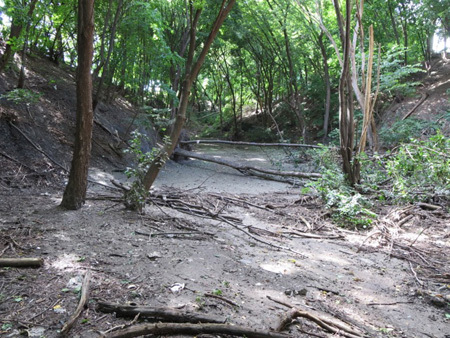 But most of all I am deeply angered and insulted by these suburbanites that run the CDPC who think that it is just fine that raw sewage should continue to run through and stink up my neighborhood and leach into the ground in Lincoln Park where the line caved in a quarter of a century ago. This is not acceptable. Clearly these suburban boys and girls of the CDPC consider the South End to be a Third World country full of half human animals whose lives don’t matter. Elberon Place Area Storm Water Storage Phases I and II, City of Albany. Connection of the stormwater collection system in the vicinity of Elberon Place to a pipe storage gallery to reduce peak flows conveyed to the CSS. 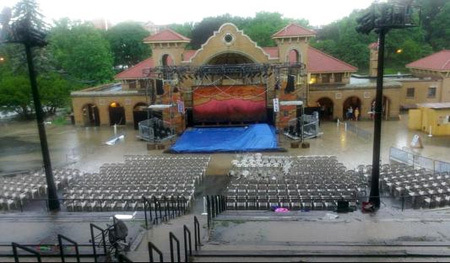 [Combined Sewage Stormwater] Reduces local flooding and reduces both the incidence and frequency of combined sewer discharge to the surface, as well as reducing the frequency and intensity of CSO [Combined Sewage Overflow] events. Construction Completion Date: 2012. Oh really? Somebody has upgraded the overflow slop tank (“gallery”) at the cost of a quarter million dollars and that’s supposed to take care of flooding? If that got completed then I guess it didn’t work too well. Actually that hasn’t happened yet, and when and if it does it won’t do a damn thing about the raw sewage coming out of Park South and the toilets of Albany Med downstream. Hell, that won’t even mitigate the next flood. Look folks, there is only one permanent solution to this very serious and unacceptable problem. A new wider gauge drain line has to be constructed parallel to the current Beaverkill stormwater line. When that is completed, the Beaverkill needs to be diverted into the new line (at least temporarily) and the old line must be upgraded and replaced where necessary. 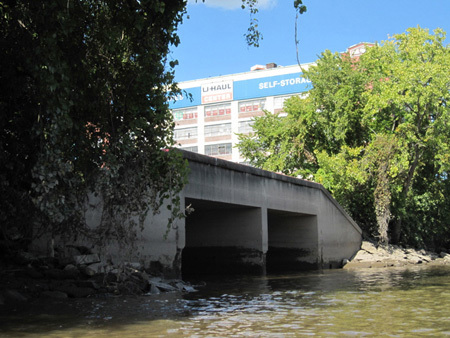 When that is completed, sewage and stormwater along the Beaverkill will become and remain separate and the threat of disastrous flash flooding of downtown Albany should be much mitigated, or possibly even a thing of the past. And that will stop raw sewage from flowing into the Hudson. Yes, this will require a lot of digging and disruption across a wide swath of Albany. Yes, it will take years to complete. And yes indeed, the project will cost a small fortune, I wouldn’t be surprised if a new Beaverkill drain line cost $100 million. But let’s put this in perspective. The State just spent $115 million to add a third lane to the Thruway between Exits 23 and 24, which took several years to build. Was this third lane essential to our health and well-being? After driving on that recently completed stretch of Thruway the other day and exceeding the speed limit (but not as much as most of the other drivers) I have to say it’s nice to ride on. But whatever. We didn’t need to increase the Thruway pavement by one third, we shouldn’t have replaced the green meridian with jersey barriers, and we shouldn’t have sacrificed a small strip of Pine Bush to widen the shoulder. I maintain that it was a boondoggle waste of $115 million of our taxes. One of the major things that separate our grand empire from marginal countries like Liberia and Afghanistan is our sewage system, that for the most part we handle our sewage and waste runoff so that it does not become a threat to our health and to our lives. Americans have completely forgotten about such diseases as cholera and typhus, which breeds in human waste. When a cholera epidemic ravaged Peru in the 1990s, thousands of infected travelers did not spark an epidemic in the US. It couldn’t happen, our sewage system is very effective. That is, except in places like Albany where the drainage system has been encouraged to disintegrate. We should be ashamed of ourselves for allowing our civic leaders to endanger our health and safety with their laziness and corruption. Where is our pride and our common sense? How did extra driving lanes become more important than our health, our quality of life and our freedom from deadly disease? It is the obligation of the federal and State governments to provide the bulk of the money needed to upgrade the Beaverkill drain line. Our government can give billions of our tax dollars to Wall Street parasites and spend hundreds of billions killing people across the globe for no discernible reason. Surely our politicians can spare what amounts to chump change to ensure the health and safety of the citizens of the capital of New York State. So our two week vacation at Lake Sacandaga has come to a close. We had to pack up the car and drive back to Albany, traveling again on that nice new $115 million Thruway driving lane. It was really nice up at the lake this year, but now we’ve resumed our old routines, doing things like patching the roof and waiting for the sewers to back up and flood our cellar again. The City, I’m happy to say, removed the rest of the fallen tree brush from our lawn. I like your blog you care about Albany and important neighborhood issues. Certainly on some issues we are alike other's polar opposites but that's what makes life interesting. Quality of Life in Albany does not exist. When you get the opportunity to travel it awakens the mind. It's amazes me something as simple as painted crosswalk lines, roadway arrows, yellow lines, can not be maintained. Heck we haven't seen a street sweeper for 6 weeks and some of the surrounding street curbs I can prove it. Now to the original point another issue no one addresses (mayor, DGS, ward leaders) city owned tree's in the ROW's. The night of the storm every tree I saw damaged-knocked over were city tree's. I estimate about 30 trees in my 1 mile radius check. In Pine Hills or the western end of the city neighborhoods are loaded along with diseased, dying, tree's. 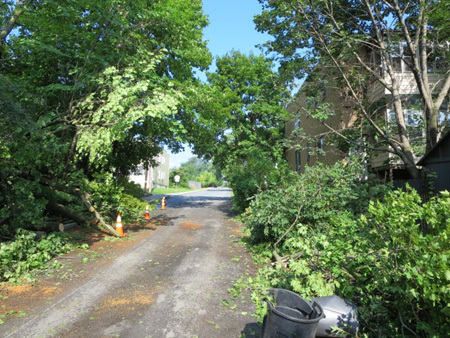 Previously I communicated with the city forester and they came and trimmed the area they left standing 2 dead trees that finally DGS removed this summer on a major road again that is used by ambulances to reach both hospitals. And our neighborhood has had sewer problems because of the city tree's roots growing in to the sewer lines and clogging them go figure. If the wind blows 5mph+ on a clear sunny day something of substance falls from a city tree in our neighborhood. All of us complain nothing happens. On two occasions I saw Manning near St. Peters Hospital blocked several locations during this storm and once earlier in May. The tree in May was so far gone it was hallowed out a 3 year old could tell something was wrong. Watching that tree it should have been gone 5+ years. I understand the benefits of tree's heck I would pay and nurture two if the city removed the old one. If we have more frequent storms, and less city interest in maintaining infrastructure above and underground we will have many more pictures to share, blogs to write, and people like me to comment. History channel did a great program Crumbling America you may want to check it out they do discuss sewers. The weird thing about that storm, and many like it, is that it was SO narrow in geography. People in Latham and Albany got it. People in Schenectady said, "What rain?" And it's been in Rotterdam but not i Albany in previous storms. I think one thing that could really help would be (or would have been?) a "digging tax." Whenever anyone (National Grid, Verizon, Time Warner, or whoever) wants to do any digging all, they'd be obliged to pay the appropriate utilities who would then piggy-back off the project. Great post. One if these days someone will pay attention to you. You've been writing about this for years. 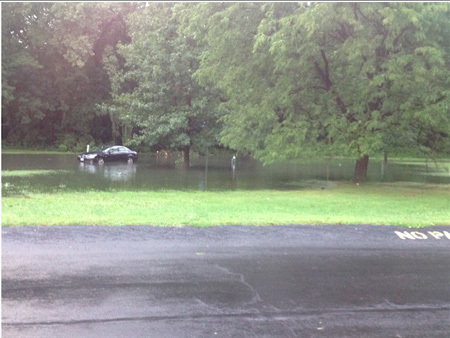 Did you go to the meeting last night at New Scotland Elementary regarding the flooding? Thanks G. I first heard about the meeting by reading the paper, so no. I understand that meeting was mostly concerned with their neighborhood, which is a ways off the Beaverkill. 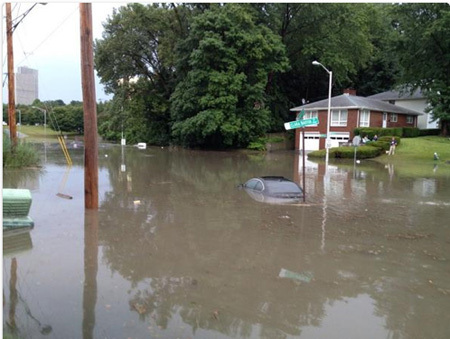 But wastewater infrastructure issues are all too common throughout the City. If sanitary sewers (as distinct from storm sewers) or combined sanitary/storm sewers are going to dump into the Hudson River at the Beaverkill, a sanitary sewer treatment plant is needed at that location. To the extent that sanitary sewage is being dumped untreated into the Hudson River at that location at this point in time is an abomination. The USEPA went on an expansive, nationwide, sanitary sewer system development effort that began in the 1960s and 1970s and it is hard to believe a sanitary sewage treatment plant was not built at the Beaverkill/Hudson River location then (or at least some time in the interceding years). The standard location for sanitary sewer treatment plants is at the ultimate outfall of the sanitary sewer treatment system. I wouldn't fight that, as it would only add significant cost to redirect the very large outfall flows elsewhere for treatment. You want this effluent treated, not left untreated, simply because the only "acceptable" solution is to pump the massive outfall volume elsewhere for treatment - that would add so much to the cost such that it could be decided not to pursue the project. 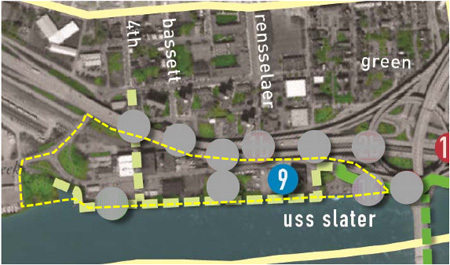 The waterfront can be designed to work around a sanitary sewer treatment plant - many are. Many times sanitary sewer treatment plant funding is tied to separating the sanitary sewer system from the local storm sewer system when those systems are combined. The reason is the volume of flow that has to be treated in combined systems - it is so large that treatment plants have to be multiple times the size they would otherwise have to be if only sanitary sewage needed to be treated, not the combined flow. Larger plants require much more money to build and to operate (i.e., day in and day out, 24/7/365...) and do so essentially needlessly - so a sanitary sewer/storm sewer separation program needs to be undertaken. That there is apparently a combined sanitary sewer and storm sewer system in the west/southern portion of Albany can effect the ability to secure funding from the USEPA for treatment plant construction - I believe the USEPA ties treatment plant funding to maximum upper limits on the amount of storm water runoff that ends up in a sanitary sewer system for which treatment plant funding is sought. However, a sanitary sewer/storm sewer separation program may get funded - and may need to be completed before treatment plant funding is awarded. A sanitary sewer/storm sewer separation project would be large and expensive but would likely solve the Beaverkill overflow problem. An appropriately-sized sanitary sewer treatment plant could then be built. whoareyou- If construction of a sewage treatment plant in the South End just for the Beaverkill line leads to funding to replace and upgrade that line, then I will consider supporting it. But I've heard nothing about that. Part of the problem, as Assemblyman John McDonald explained to me, is that putting together this regional wastewater plan has involved a lot of delicate negotiations which have been held behind closed doors. Thus the public has been kept out of this, so we don't know what our elected leaders are up to except in hints. But the Beaverkill is not supposed to carry raw sewage on a daily basis. The plant is a proposed bandaid on a cancerous tumor. How much does one pay to remove a cancerous tumor? Last night I heard more about that public meeting that G mentioned above. Apparently over a hundred people were practically begging our City officials to do something to stop the flooding. Yes, the mayor was in attendance. If people continue to pressure our officials, things will happen. I'm hearing more people say that the houses of lower Elberon should be demolished before they sink into a hole. Actually, there used to be more houses there in the 1980s, they simply fell apart. So you may be right about that spot. Maybe that's where a catch basin should go, but have you considered that Washington Park Lake may have originally been the intended catch basin? As for suburbanites, right now the prevailing attitude among them is that Albany is a bad place that ought to be starved to death. However, I expect that in the foreseeable future that the older neighborhoods of downtown Albany, including the South End, will become an enclave of the rich and all the underclass people will be forced to move to the suburbs. When that tipping point is reached, and the suburbanites start wishing they could live in Albany, then I will change my attitude toward suburbanites. And BTW, if the South End were a rich neighborhood today, then that Beaverkill drain would have already been fixed and damn the cost.